You are in: Home \ UKSA's #SeaChangeStories Blog \ Award winner!! 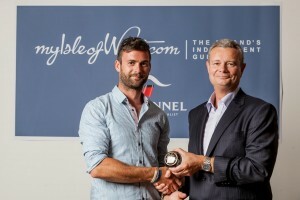 UKSA is delighted to announce that we won an award at the Red Funnel myisleofwight.com 2013 awards! For the second year running, we took the prize for Best Water-Based Activity Provider. This is a great achievement as this award is voted for by members of the public. So a huge thank you goes out to the whole UKSA team for making this possible. Pictured is Seb Godsmark representing UKSA and Kevin George, CEO of Red Funnel.